Oliva Nova is an incredible development perfectly situated in Oliva, the last coastal Valencian town before reaching the province of Alicante. Oliva Nova offers a high quality of life in a fabulous natural environment between sandy beaches and a fantastic golf course. Located 50 minutes from Valencia city and one hour from Alicante, Oliva Nova finds itself close to a large number of coastal towns such as Gandía, Denia and Jávea which can be reached in under 30 minutes by car. These towns as well as Oliva, which is home to 28,000 inhabitants, offer amenities and leisure activities. The Oliva beach stretches for nearly 12 kilometres and features some protected sand dunes. Large and comfortable, the beach is washed by the temperate Mediterranean waters which are warm enough to swim in during several months of the year. The exceptional quality of the beaches, the aromatic orange groves and the mountains create a spectacular natural landscape. Lying close to Oliva Nova, the protected Pego-Oliva Marsh Natural Park is filled with numerous freshwater pools and old irrigation channels. Originally a bay, the clogging process turned it into a lagoon and, subsequently, marshland. The area is abundant in wildlife native to the area as well as featuring the Fuente Salada, a spring with healing properties. The Oliva Nova development is composed of villas and apartments as well as an 18 hole golf course designed by Severiano Ballesteros. Occupying some 50 hectares of land, the course has a par of 72 and 6312 metres of green. Water obstacles are introduced in 15 of its holes, and the course is ideal for players of any level. The best score on record is that of Miguel Ángel Jiménez, with 63 strokes 9 under par, just incase anybody wants to challenge him. In Denia and Jávea one can find other prestigious golf courses. Transport links to and from Oliva Nova are excellent. The Mediterranean motorway AP-7 and the N-332 are easily accessible, and connections to the airports of both Valencia and Alicante are good, both being approximately one hour away. Boats sail from the port of Denia (18 kilometres from Oliva Nova) to the Balearic Islands as well as many other destinations. In terms of marinas, Oliva’s own port can be found 5 kilometres from the development and there are further marinas in Gandía (17 kilometres), Denia (18 kilometres) and Jávea (29 kilometres). 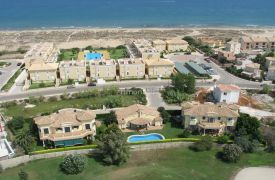 Browse Oliva Nova Golf property for sale listings.